Spurs Legends at The Bury. 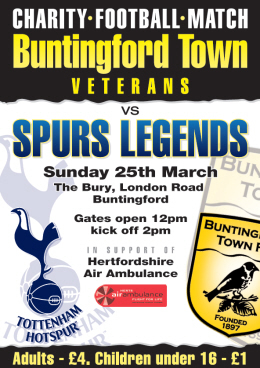 On Sunday 25th March the Spurs Legends will be playing a charity match against Town's Veterans, in support of the Herts Air Ambulance. Unlike NHS emergency services the Herts Air Ambulance is a charity providing a free life-saving Helicopter Emergency Medical Service for Hertfordshire. It costs in the region of £130,000 per month to cover all charitable costs and aircraft operations, so every penny we can raise will help this worthy cause. Kick-off is at 2:00pm, and gates open at 12:00; entry is £4 per adult and £1 for kids. So get to The Bury on the 25th and enjoy a great game of football and meet the stars of yesteryear!